Push Notifications allow app developers to notify users at any time, users don’t have to be in the app or using their devices to receive them. With the help of some good tutorials, push notifications can be implemented very easy in Ionic which supports both iOS and Android. 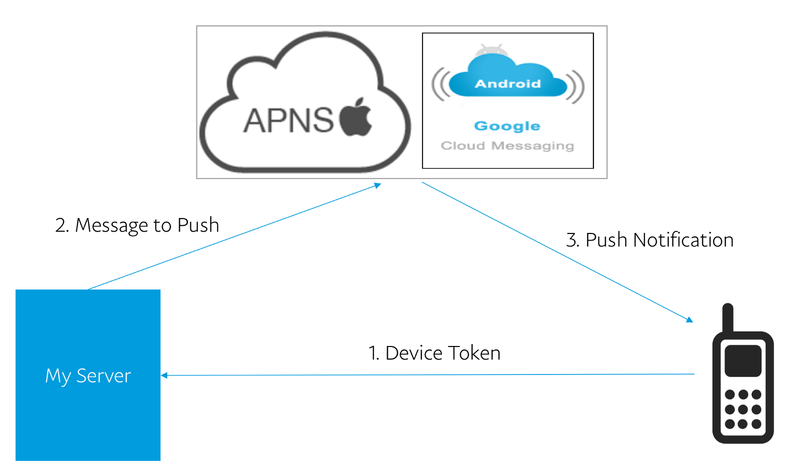 Android uses FCM(Firebase Cloud Messaging (FCM) earlier known as GCM) and iOS uses APNS for push notification. For Android, follow FCM setup instructions. It will give you SERVER_KEY and SENDER_ID. SERVER_KEY is used by server to send push notification and SENDER_ID is used by device to generate device token. For iOS, nothing required to generate device token. Run on physical android and iOS devices to see device token in console. Use Xcode to run on iOS device. Note down device token to send push notification. Device token doesn’t generate in browser or simulator and might give exceptions which you can ignore. For Android, run below java code to send push notification. Replace DEVICE_TOKEN by device token obtained from device and SERVER_KEY by Server key obtained from FCM. // Create connection to send FCM Message request. // Send FCM message content. That’s it, push notifications working on Android device. For iOS, there are few additional steps to generate some certificates. You must have paid developer account to generate certificate. Follow APNS setup instructions to generate .p12 certificate. Use following code to push notification to iOS device. It uses https://github.com/notnoop/java-apns. That’s it, push notifications working on iOS device. See references for push notification server and client code on github.